Caring for your children’s teeth from a young age is very important. Establishing a proper oral care routine from a young age sets the foundation for the development of healthy and strong permanent teeth for life. 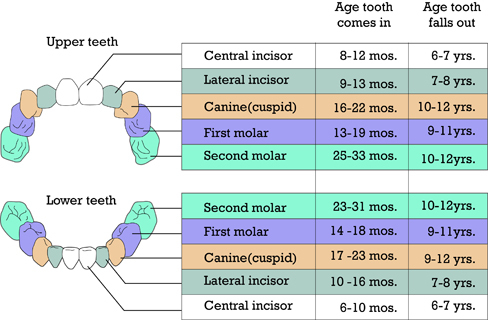 Primary teeth (deciduous or milk teeth) are essential in the development of your child. 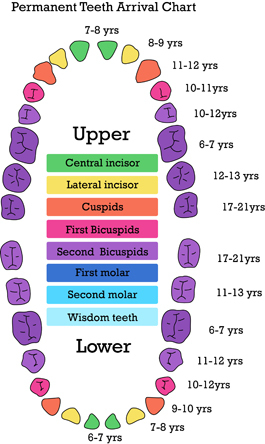 Primary teeth start to erupt in children from the age of six months; this is generally complete by about two and half years old. As soon as your kid’s primary teeth start erupting it is important to start brushing them. Use a baby toothbrush or a damp gauze with a tiny smear of children’s toothpaste. Don’t worry if you don’t manage to brush much at first, the important thing is to get your baby use to teeth brushing as part of their daily routine. You can help by setting a good example and letting them see you brushing your own teeth. Gradually start brushing their teeth more thoroughly, covering all the teeth surfaces. Brush both in the morning and at night, paying particular attention at night. Not all children like having their teeth brushed, so you may have to keep trying. Avoid turning it into a battle, it may help to make it into a game or brush your own teeth at the same time and then help your child finish their own. The easiest way to brush a baby’s teeth is to sit them on your knee with their head resting on your chest. For a child, stand behind them and tilt their head upwards. Use gentle round circles covering all surface of the teeth and allow your child to spit out afterwards, it is best not to rinse with water as this washes the fluoride from the teeth. It is best to carry on helping your child brush until they are about 8 years old. If time doesn’t allow for this you may find it easier to allow them to brush in the morning by themselves and help and/or supervise them before bed. In addition to oral hygiene, diet also plays a key role in keeping teeth healthy. As much as possible, children should be limited in the amount of sweets they eat and how often their teeth are in contact with sugar. Sweet drinks in a bottle or feeder cup and things like lollipops are particularly damaging as they bathe the teeth in sugar for long periods of time. Acidic drinks such as fruit juice also harm teeth and should be given at meal times, not in between. At Terrigal Beach Dental we understand the importance of making a trip to the dentist something that is fun and relaxing. This is why we suggest bringing your child with you for your appointment from the age of three or four years old. At their first appointment we can take them for a chair ride and count their teeth together on our “tv” screen. These early fun appointments will create a positive association with the dentist and prevent them from developing a fear or phobia that may affect them for life. Finding a great paediatric dentist on the Central Coast that your child can get to know and trust is the best way to keep their teeth healthy for their whole life. To make an appointment for your child, contact Terrigal Beach Dental.